Prolab Beta Alanine Extreme is the supplement for you if you want to train harder, longer and get results (build muscle, lose fat, get stronger) faster. Backed by more than a dozen scientific studies, taking it enables you to keep pushing when your legs and lungs starting burning. Why Should I Take Prolab Beta Alanine Extreme? Sure, there are many supplements for you to choose from. Below are the reasons you should choose Prolab Beta Alanine Extreme as your beta alanine supplement. Clinically Proven Dosages – every serving gives you the amount found to be effective in dozens of scientific studies. Research Backed Ingredients – uses the Carosyn brand of beta alanine, the type found to work the best in several clinical trials. Time Released For Better Results – minimizes the tingly feeling some people experience. Keeps more available for your muscles. Convenient, Easy To Swallow Caps – no mixing powders or clean up. Train Harder- get the last couple of reps and new personal records. Build A Better Body – studies show it helps you build muscle and lose fat faster than just lifting weights. Get Stronger Faster – do more chin ups, add more weight to the bar and build strength faster. Get A Step Up On Your Competition – beta alanine helps you react faster so you are the one to win the sprint or get to the ball first. Beta alanine an amino acid that’s made naturally in our body from the protein (beef, fish, etc.) we eat. You need to take it as a supplement to see benefits since it’s not possible to get enough of these specific proteins from food alone. Studies show it is safe for healthy men and women to take. It helps to ‘buffer’ our muscles during intense exercise from fatigue. That is, it increases the time that it takes for your quads, hamstrings, and biceps to quit when you lifting, sprinting, and jumping. You will notice benefits after about 2 weeks. The harder you’re training and competing, the more you’ll get from this supplement. Who Should Take Beta Alanine? All of us who train hard and push ourselves to new personal records. It works best for activity that lasts between 1-4 minutes. High rep workouts – kettlebell swings, squats, etc. How Should You Take Beta Alanine? Research finds that you’ll get the best results from by first ‘loading’ your muscles with larger dosages for 3-4 weeks. After this, you can back off to a smaller daily dose. Loading (4 weeks) – 800 mg 4 times a day. Maintenance – 800 mg 2 times a day. When taking as recommended, one bottle of Beta Alanine Extreme will last 30 days. Who Won’t Benefit From Beta Alanine? 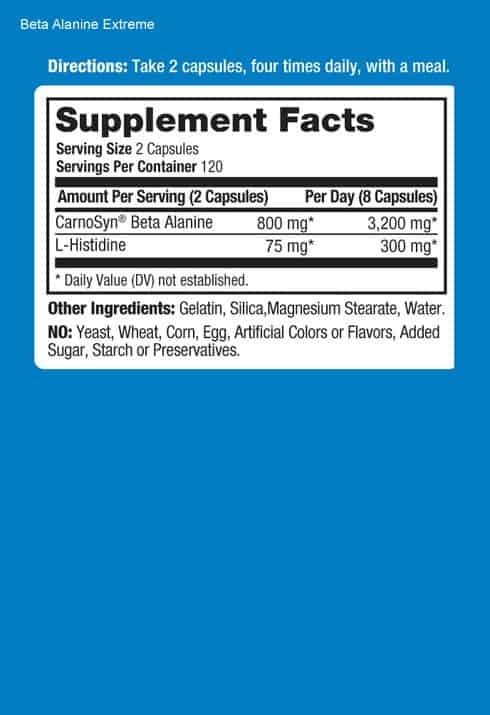 Do Any Other Supplements Enhance the Effects of Beta Alanine? Yes. Research shows that taking beta alanine with creatine monohydrate can help you get more benefit than if you take either supplement alone. Another study shows that taking it with baking soda may make its buffering (delaying the burn) abilities even better. This reviewer, Curt, takes 2 capsules 3-4 times per day, about every 3 hours. Let me know what you think of Prolab Beta Alanine Extreme and if you’ve noticed any benefits of Beta Alanine, or if you have discovered another great beta alanine supplement. MCT Oil Supports Fat Loss, Focus, Energy.